Please note: you should register your interest via our online form, or email digital@unison.co.uk before purchasing a website. 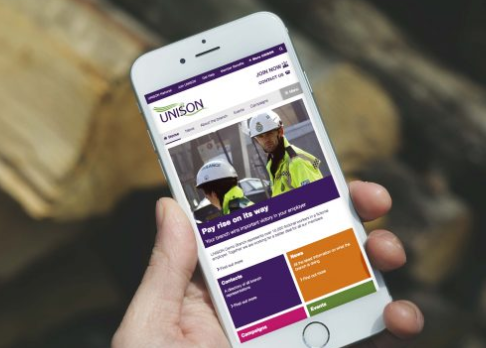 Designed specially for UNISON branches, building on the design of the main UNISON site and fully responsive to mobiles and tablets. The price includes secure hosting. If you select this option £300 will be debited from your account each year. Take advantage of a purpose-built theme which builds on the powerful design of UNISON’s national and regional websites. Choose a powerful image from a shared image library pre-populated with key campaign, sector or regional pictures. Easily include videos, tweets, image galleries and other powerful content into your stories and pages. Access statistics showing you how your site is faring and what content users are loving at the moment. Create news stories, blogs, events or campaigns and show off all the work the branch is doing. Create content on the go using a powerful iOS or Android editor app to add your news or images. Ensure members – and potential members – can reach you using a customisable contact form. Let everyone know who’s who in the branch using the built-in Branch Directory to list all branch officers and their roles. Access step-by-step help guides and videos explaining how to undertake all common tasks. For a small amount extra: Subscribe to one of our support packages where UNISON Dragon Court Print Services will give you dedicated support, or even take care of adding your day-to-day content. Take advantage of economies of scale by joining with other branches. A single small yearly subscription and you get a design and features that would cost tens of thousands of pounds to develop. Your site updates with new features automatically so you never need worry about your site falling behind the pack. Know your site is secure and always accessible, as it is hosted securely by us, with logins through My UNISON.